An early Georgian low back x-frame forest chair with painted decoration. One of the earliest surviving records for the production of Windsor chairs comes from the accounts of Lord Stanhope, who acquired a set of ‘Forrest’ chairs in the 1720s for Chevening House in Kent. Several dozen of these, named for their painted decoration and external use, were inventoried among his garden tools and wheelbarrows, and for good reason. Early examples like these would have been made by carpenters whose trade was otherwise dominated by the construction of cart wheels, wheelbarrows, and other utility objects. They were light and portable on account of their skeletal back rests, and more often than not were painted with resistant, lead-based green or grey paints to weatherproof the wood, though early makers also advertised them unpainted; “in the wood”. By the mid-eighteenth century, Windsor chairs had also found a place inside the house, and one of the finest sets can be found at the Bodleian library, preserved alongside the original bill made out for three dozen of them in 1756. However, an unparalleled collection resides at West Wycombe Park, where over thirty of the rarest examples are displayed inside the house. Several more, employed in the park’s gardens and pavilions and painted in a blue-grey livery, have remained in daily use for 250 years. 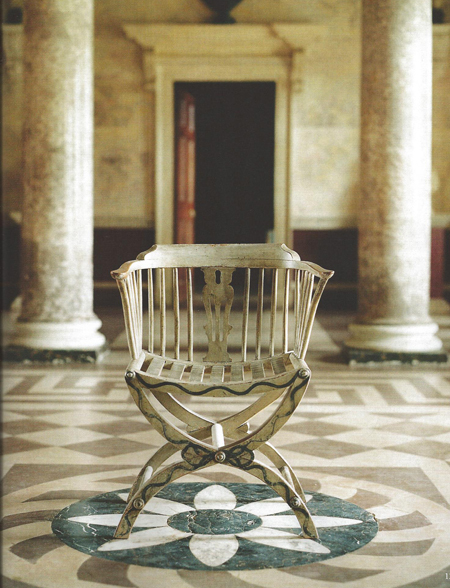 The house and park are celebrating their collection with a special display of the chairs, which runs until 30th May. The draw for many people lies in the Windsor chair’s truth to materials, utilising traditional English wood types such as beech, elm, yew, and walnut. More importantly, it actively shows off these woods, with no upholstery of any kind (this also led to the style’s popularity for use as highchairs and children’s furniture, for obvious reasons). Moreover, the undulating, shaped seat (made of elm on most examples) meant that the grain of the timber could be gouged into, revealing a magnificent ‘flamed’ display of its growth rings. Similarly, the straight back rests, as well as the later steam bent backs, and hand-turned spindles or ‘combs’ provided an architecture that few other designs surpass. The simplicity of construction nevertheless belies the artistry that quickly developed during the eighteenth century in the production of Windsors, and many of the finest examples employ exquisite carving. As a result of this aesthetic transmutability, the style has lent itself to varied aesthetic movements throughout the years, from Gothic arches to mid-Georgian austerity, as well as the more decorative coin-shaped splat examples now commonly associated with old public houses (if you’re visiting Norfolk, try the Gunton Arms, where many early Windsors of this design sit around the dining tables, and the beer’s good too). The attraction of the Windsor chair remains, translated into comb-back furniture by designers such as Charles Rennie Macintosh at the turn of the twentieth century, and later seeing a revival in the Ercol factory during the forties and fifties (in 1944 the Board of Trade ordered an astonishing 100,000 Windsor chairs from them). Early examples are now fairly scarce, despite their mass-production in their heyday, and things to look out for are good uses of timber, solid construction, warmth of colour and original spindles. It is testament to the Windsor’s enduring elegance that they are seeing something of a resurgence amongst the new interior-design elite, and good examples are just as much at home underneath a Warhol print as they are next to a crackling log fire. The exhibition at West Wycombe Park is not before time, and long may our love of the Windsor chair continue.